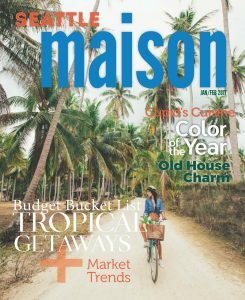 January/February 2017 Issue of Seattle Maison: renew, refresh, and rejuvenate! The January/February 2017 issue of Seattle Maison is all about renew, refresh, and rejuvenate! There are some fabulous images that demonstrate all the fun, beautiful ways you can work the Pantone color of the year, Greenery, into your home décor. On page are perfect pairing with Greenery, everything from a monotone look to a retro vibe to the cool tones reminiscent of a winter’s night. Lovely! If decluttering is one of your New Year resolutions, check out the article on pages 8-10 to get the skinny on how to best recycle those old electronics. You can start planning your Seattle area Valentine’s Day date night with the article Cupid’s Cuisine on pages 13 and 14. There is so much more in this wonderful issue – planning a tropical get-away for some much needed R&R, special touches to add vintage charm to your home, and of course some King County real estate statistics to keep you informed. I hope you enjoy the first Seattle Maison issue of 2017 as much as I do. If you would like to the one of the first to get your own issue in your inbox, please send an email to kathryn@windermere.com and I’ll add you to the mailing list for the next issue. And for now, you can read the whole January/February issue right here!